On July 19, 1979, there was a very strong tropical storm in the Caribbean Sea near the Venezuelan coast very close to Tobago. Two ships, the Atlantic Empress and the Aegean Captain, were out on the sea trying to battle through the storm. The storm was extremely severe and weather conditions were horrible and the two ships collided. The Atlantic Empress, a fully loaded supertanker, carrying millions of gallons of oil, exploded into flames. 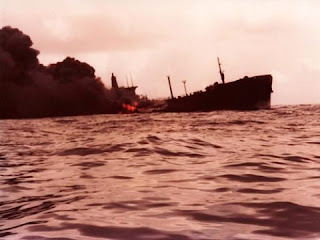 Along with the explosion came the rushing of oil into the water, which wasn’t stopped until August 3, 1979. A lot of the oil that was leaked burned in the fire; however, by the end of it all, 90 million gallons had seeped into the water near Tobago. The Atlantic Empress eventually sank, which brought an end to this oil disaster. Today it stands as the largest ship oil spill today.